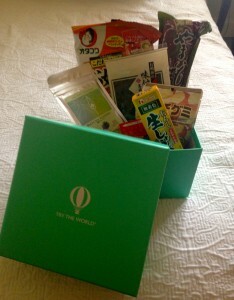 The Try the World box from Japan. Good thing I have an English book to translate what the products are. I love the box subscription trend, and have found one that combines two of my favorite things – food and travel. Try the World delivers a box of gourmet foods sourced from around the world, focusing on a different country each time. These boxes contain 6-7 products, delivered every two months. Because Try the World works with small producers, each box may be slightly different. With a subscription you get free shipping, free returns and you can cancel any time. My beautiful close-to-Tiffany-colored box from Japan arrived the other day. I dug through the red crinkled paper to pull out items like an okonomiyaki kit, which I can use to make an omelet-like pancake with savory toppings. I also got ginger paste, blueberry matcha tea, gummy candies, traditional Japanese caramels, soba noodles and a seaweed snack. The products were accompanied by a beautiful Culture Guide of Japan with instructions and recipes for hosting a traditional Japanese tea ceremony and make-your-own okonomiyaki dinner date that even included a Spotify playlist of Japanese songs. Individual products, such as Palmiers butter cookies from Morocco, chestnut cream in a tube from France and black truffles and mushrooms from Italy are also available. While most of us can’t always be traveling the world, with these boxes we have the a chance to enjoy flavors from across the globe. Or try a few that remind us of visits to our favorite countries. Very cool ! Thanks for sharing ,Jan !